The SILVER and GOLD PRICE rose. Silver gained 18.9 cents (1.2%) to $15.726 while the price of gold jumped $9.90 (0.85%) to $1,172.90. All the same, the silver and gold price charts show nothing but suspicion they MIGHT turn up, but also suspicion they might break down. Here’s the range that doesn’t tell us anything new: for the GOLD PRICE, $1,155 to $1,190; for silver, $15.44 to $16.40. I remind y’all that we are now in the window for silver and gold prices to make their seasonal lows, and we will probably see those by this week’s end. I have a foreboding — can you say, “I forebode”? — that this eerie peace in markets is the calm BEFORE a storm. I hope I’m wrong. It remains in the interests of the Eurocrats not to suffer a breach with Greece, lest others get the idea they might wriggle out of their impossible debts. Therefore they will continue to keep talking the problem to death until the public experiences utter “crisis-exhaustion” and will accept any solution at the price of not having to listen to any more about it. What if somebody gave an economy, and no banks came? Could the economy run with people paying each other in cash? Inconvenient for a while, but possible. Shucks, to be rid of the banks is worth a three or four year financial crisis. US Dollar Index’s reaction to the aftermath of Greece’s referendum was muted. 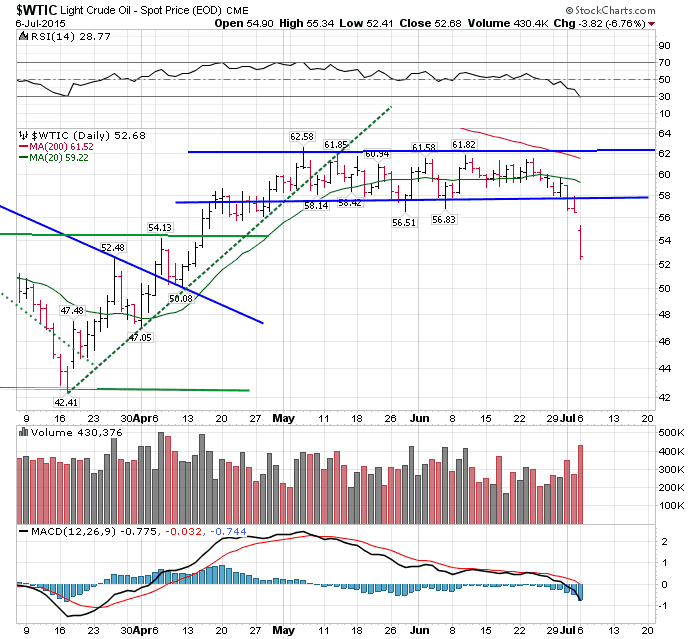 It rose 19 basis points (0.2%) to 96.49, technically not a breakout over 96.50 support, but not far and pushing. Since mid-June the Dollar index has been in an uptrend, and remains in that uptrend. Greece will eventually drive it higher. Hot money looking for a safe perch sent investors into US treasury securities. That showed in the dropping yields (as bond prices rise, yields fall) in the 10 year treasury note down 4.81% to 2.278%) and the 30 year Treasury bond (down 3.79% to 3.071%). Not a stampede, but enough for yields to gap down. Euro fell 0.26% to $1.1056, not as far as reason expects, but given that ALL central banks manipulate exchange rates, especially during crises, that’s about right. As the dollar index is about to break out upside from an even-sided triangle, so the euro is fixing to break out downside. Once dams burst, it’s tough to rebuild them during the following flood. Japanese yen caught some safe have bid from Europe, rising 0.44% to 81.62. Still needs to cross 82.25 before it proves much. STOCKS have closed lower two weeks running. Today they melted again, just enough to demoralize. Dow lost 46.53 (0.26%) to 17,683.58. S&P500 peeled off 8.02 (0.39%) to 2,068.76. Stock drops combined with metals’ strength sent the Dow in gold below its 20 and 50 DMAs and the Dow in silver below its 20 DMA. There’s a Big Drop a-comin’. West Texas Intermediate Crude today fell badly out of the range that has contained it since May began. That’s only the beginning.See chart on the left. 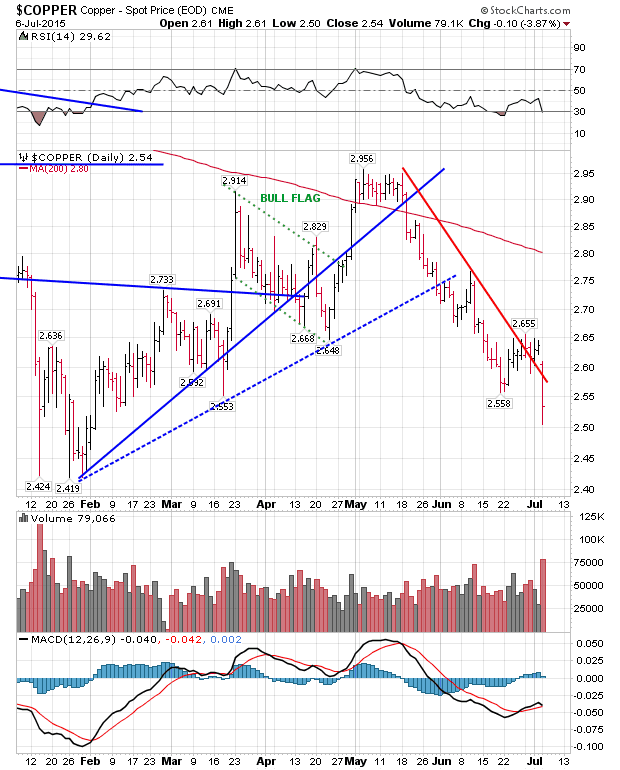 Copper also fell hard, 3.75% to $2.54. Chart argues it will fall as far as $2.42, on the right.